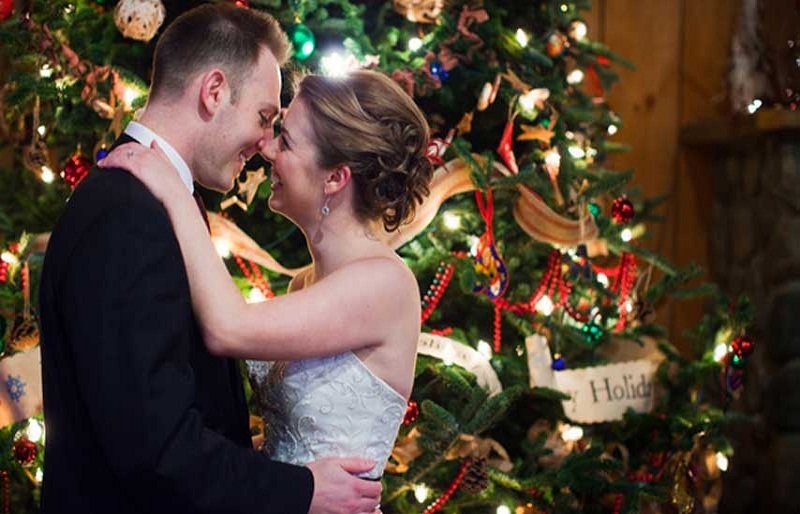 WEDDING AT CHRISTMAS- For many, Christmas is the best time of the year. In the environment reigns peace, joy, forgiveness and friendship. Of course, love is the main protagonist of this beautiful date. If you have already chosen winter as the perfect season for your wedding, it is well worth reviewing a Christmas-themed wedding. It will make your day, something much more sweet and romantic. 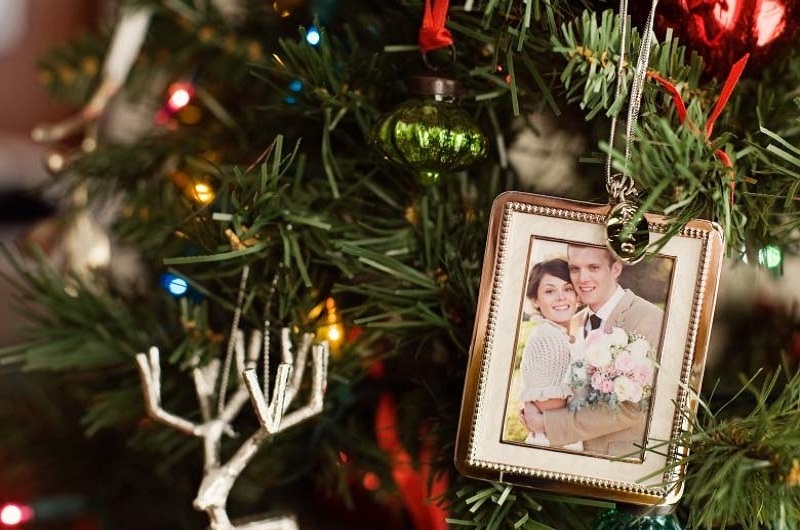 Check these ideas so that your wedding will have a Merry Christmas atmosphere! To decorate your entire wedding you will need a basic color palette. For Christmas the red, green, olive, gold, silver and gray are perfect. Try to combine them in invitations, centerpieces, ornaments and souvenirs. Thus, they will shout Christmas without needing more explanations. They are in charge of telling your guests what your event will be like. Therefore, you have to put a lot of effort into them. Craft-type papers, green and red colors, with gold details and cursive typography, are excellent exponents of Christmas. You can also add items such as snowflakes, poinsettias, golden or silver bows and all the elements that remind you of the date. You need poinsettia flowers, dried pineapples, olive branches and lots of green foliage. You can place bouquets with these combinations as centerpieces. Garlands and mistletoe can also decorate each space. Also, if you add scented candles you can create a much more welcoming effect. Hanging garlands are also a very good option so do not leave them out. 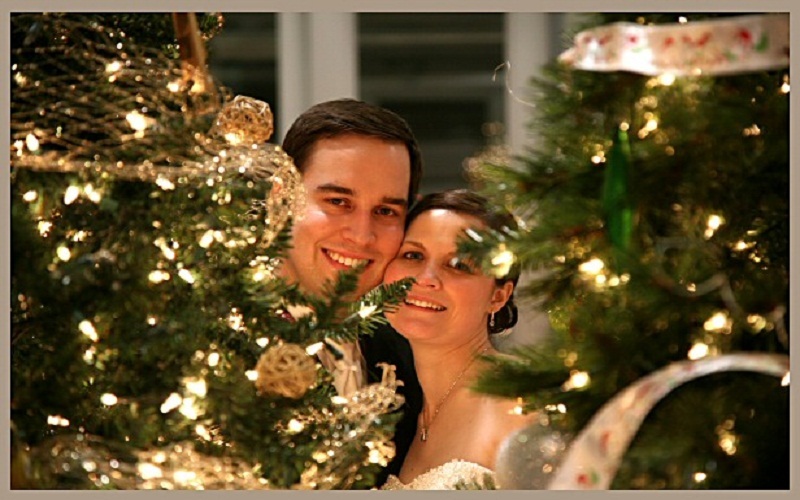 If you really love Christmas, you can not stop placing a Christmas tree to decorate your wedding. In it they can place spheres of paper in which the guests can give their good wishes. If we think of Christmas decoration, the color that will come to our mind the fastest is red . But there are more colors you can use (in small doses, otherwise it will be too heavy), as are the gold and silver , festive tones par excellence that will give the perfect touch to your Christmas wedding. How to use them? Very simple, to incorporate these tonalities to your Christmas wedding decoration, we suggest you do it for example, through a centerpiece of flowers, candles (they will give the warm touch that this Christmas celebration needs), or even in a big way with a tablecloth. If decorating your wedding to the Christmas style seems too much or you want to further enhance the spirit of these dates, the traditional gifts to the guests can also be a great way to do it. Our advice? Give something to your guests that they can use to decorate their house at Christmas, as decorations for the tree, for example. Simple, practical, and very original! While it is true that we decorated our wedding at Christmas based on the tonalities of the time, as we have said before, it is fundamental, but small details are not less important. For example, a mini Christmas tree will give the table the festive touch, but also the pineapples or a tiny golden reindeer like the one in the photo , adorable! In addition, another option is to use red Christmas balls (or any shade of the time) to organize the seat plan, decorate the chairs with Santa Claus hats, or even discreet napkin rings with Christmas motifs if you want a slightly more discreet decoration . You can also use bows for chairs, star-shaped ornaments, old gold cutlery, pineapples as a table ornament, or snowflakes. Of course, traditional Christmas music such as Christmas carols can not miss if you are going to celebrate your wedding at this time of year. It is not recommended that this music be played during the entire ceremony, only until the moment of dancing. Apart from the decoration, there is another idea that you can put into practice to make your wedding even more special on these important dates of the year and it is through catering. Our advice? Offer the guests a typical drink of the time such as hot chocolate , or cocktails with red fruits. What would a wedding be without its flower ornaments? Never miss a wedding and if yours is a Christmas ceremony, bet on typically Christmas flowers adorning the place of the ceremony (they can be as table decorations). Some of those flowers we are referring to are the poinsettias and the traditional mistletoe . The combination of candles and holly branches is also a great idea to decorate your Christmas wedding. To get the cozy atmosphere that all Christmas decoration requires (and more in the case of a wedding) a good idea is that you choose a place for the ceremony that has a fireplace, something very Christmas. But it can also help to place garlands of lights that give the touch even more festive. 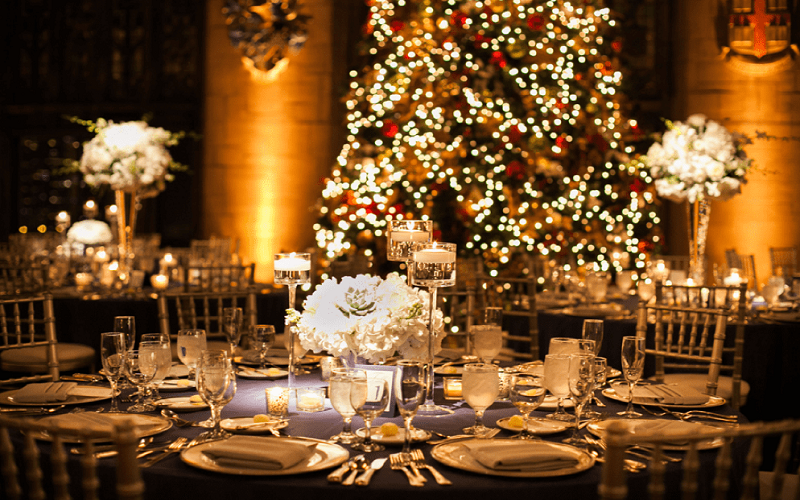 Of course, when it comes to a Christmas wedding, you can not miss the classic tree. In the post look of the bride and groom for a winter wedding we suggest which fabrics and styles are best at this time of year. But if you also add the joy of Christmas, you can use accessories with the colors mentioned above. The groom may wear a tie, handkerchief, socks or a plaid vest. The bride can use a scarf or details like bows made also of plaid. It is not that they dress up as Christmas elves, but that they seek to give a different and Christmas touch to their look. Christmas lends itself to give beautiful Christmas details. Decorative pineapples, sweets, boots full of sweets, decorative spheres with details of your wedding, a craft card; They are perfect details to show your guests the appreciation they have for them. They can also give something useful: scarves, gloves and hats will be indicated. The majority of couples that organize a wedding usually bet on the spring and summer months since that way they ensure a pleasant climate and temperatures for the day of the link. However, there are also many who prefer to share with their family and friends this special day on one of the most important dates of the calendar, Christmas. Do you also want to get married at the end of the year? Do not you know how to make a wedding at Christmas? We offer you all kinds of ideas to make this celebration one of the unforgettable moments of your guests and your partner. Invitations. What better occasion than the day of your wedding to send your loved ones a Christmas card. If you get married at Christmas you can turn your wedding invitations into a perfect excuse to send your best wishes to friends and family. You can take advantage of the Christmas decorative elements for the design of them and include a photograph of you including the date and location of the link. Ceremony. 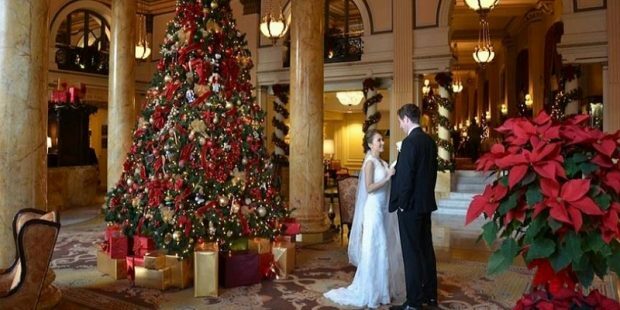 Whether you marry for the Church or for the civil thing, Christmas is the best date to turn the place of the ceremony into a romantic setting. Lights, candles, Christmas elements, red ribbons, white flowers and garnets, a choir to liven up the link; the possibilities are endless. Also, if you put the date of your wedding on holidays you will ensure that most of your guests can attend the ceremony. Photographic report . Many couples have doubts about the scenario in which to make the photographic report on the day of the wedding; If you get married at Christmas you will make sure that any corner of your city is perfectly decorated. You may not even have to go too far away from the place of the ceremony or the banquet and avoid long journeys to enjoy the most romantic place for your photographs. In the same way, if you are going to do a photographic report of pre-wedding or post-wedding, take advantage of the Christmas dates to give the magical and charming touch that you want these images to have with your partner. Arrival. If the place where you’re going to get married does not usually snow, you can recreate a scenario where the snow is the protagonist using artificial snow, placing a white floor and using Christmas decoration to make your arrival unforgettable for attendees. You can choose classic Christmas songs for the arrival to the banquet or even hire a couple of musicians to entertain your newly married couple with violins. Decoration. 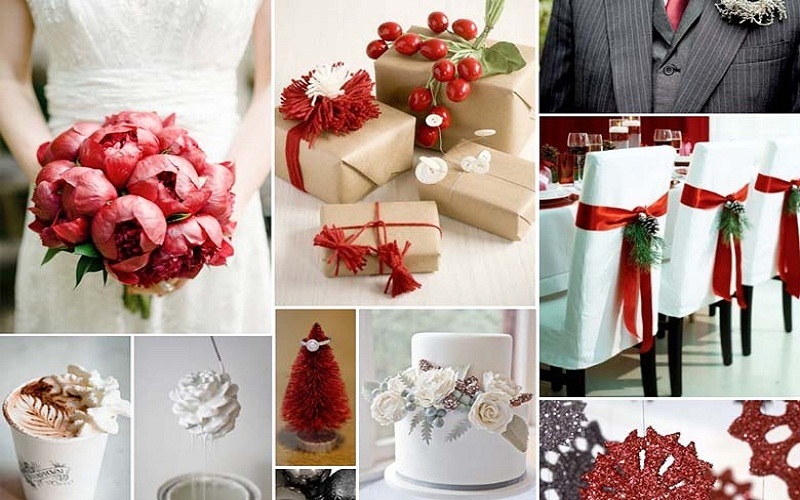 Decorating a wedding at Christmas is very simple since most elements are festive and romantic. You can use centers of tables with pineapples, candles, glass ornaments; In any case, the colors that should not be missing are white, red and gold. Surely in your banquet you will have decorated the restaurant with a large Christmas tree, so you can deliver the details of the guests from it or leave some toys under it for the smaller guests. Wedding cake at Christmas. Undoubtedly, the Christmas wedding cake should be white and carry decorative elements typical of these dates such as holly, red ribbons or make golden drawings on it. You can ask that the confectioners simulate that the cake is covered with snow and that it is actually cream or white chocolate. For the ‘Doritos’ of the cake you can order funny figures related to Christmas such as snowmen, a Santa Claus and a Mama Noel or two boyfriends who go with Christmas hats. Honeymoon . And to start your new stage as husband and wife nothing better than enjoying a few days on your Honeymoon in the middle of winter . Where to travel at Christmas? You can take advantage of the fact that in the northern hemisphere it is cold to go to any of the countries of the southern hemisphere such as Chile or Australia, enjoy paradisaical beaches of the Caribbean or the Maldives or take a cruise through the icy north of Europe knowing the Norwegian fjords. All weddings are beautiful, whatever the time, they all have their beauty and charm. The vast majority of couples who decide to organize a wedding usually do so in the spring and summer months. The weather and temperatures are warmer for your wedding day. But there are also many couples who prefer to marry in Autumn and Winter, especially on Christmas days. If you are thinking about giving the Yes I Want, in Christmas we leave you in this post some ideas so that your Christmas wedding is unforgettable and very original. Let’s start with the invitations. The best time to gather all your family and friends, Christmas days, you can choose your wedding invitations with Christmas motives, and at the same time make some Christmas greetings as thank you cards that the day of your wedding after the cake you can give them all, it will be a beautiful gesture that your family and friends will love. It touches the moment of the ceremony , as a trend in this 2017 and for 2018, is to marry in gardens, outdoors, a garden at Christmas, snowy although something cold will be beautiful and very emotional. It is the same if you get married in a church as if you are doing it civilly, Christmas is an ideal date to turn the place of the ceremony into a romantic setting. Lights, candles, candelabras, Christmas decorations, red ribbons, white flowers and garnets, a choir to liven up the ceremony, even the cocktail, are many options. We arrived at the moment of the wedding photos, many couples have doubts about the photographic report on the day of the wedding; at Christmas it is certain that any corner will be deliciously decorated. You may not even have to go too far away from the place of the ceremony or banquet to enjoy the most romantic place for your photographs. In the same way, if you are going to do a photographic report of pre-wedding or post-wedding, take advantage of the Christmas dates to give the magical and charming touch that you want these images to have with your partner. A Christmas wedding with a snow decoration is beautiful, if where you go to marry it does not usually snow, you can recreate a scenario where the snow is the protagonist using artificial snow, and using Christmas decoration to make your arrival unforgettable for the guests. You can choose classic Christmas songs for the arrival to the banquet or even hire musicians to entertain your newly married. Decorating a wedding at Christmas, it ‘s simple most elements are festive and romantic. Use centerpieces of tables with pineapples, candles, glass ornaments; In any case, the colors that should not be missing are white, red and gold. Wedding cake at Christmas. Undoubtedly, the Christmas wedding cake should be white and carry decorative elements typical of these dates such as holly, red ribbons or make golden drawings on it. You can ask that the confectioners simulate that the cake is covered with snow and that it is actually cream or white chocolate. For the ‘dollitos’ of the cake you can order funny figures related to Christmas such as snowmen, a Santa Claus and a Mama Noel or two boyfriends who go with Christmas hats. Gifts for guests, surely at your banquet will have decorated the place with a large Christmas tree, where you can leave gifts for guests. For your guests you can choose some blankets that you will appreciate we are sure of it and it is a gift for 2018 very original. For the little ones with any toy you will be phenomenal. The last detail of your Christmas wedding, the Honeymoon. A trip in the middle of winter, you can choose a trip through the Caribbean, to enjoy beach, sun, and mojitos a gogo, while here we freeze cold. Enjoy Caribbean beaches, the Maldives that are a beauty. Finally, weddings at Christmas are much more special and romantic, and also the decoration will be left to you. On these dates so indicated, we have decided to bring you a small collection of ideas to decorate your wedding with a lot of Christmas spirit and make it spectacular. Your guests will never be forgotten! If you are looking for inspiration, these ideas that we propose you will be of great help and will make you want to say ‘yes, I want’ to a wedding at Christmas. A perfect wedding for those who are looking for something different and that will be perfect. ← How To Choose A Photo Epilator For Home Use? How To Wash The Air Conditioner?